Price shown is deposit only. Total workshop price is $350. 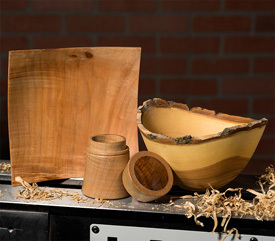 This intermediate level Wooturning 201 Workshop is ideal for those who want to further advance their overall woodturning skills and learn advanced techniques. The emphasis of this workshop to help students learn more advanced tooling techniques while working on more challenging projects. Proper tool use, tool techniques and sharpening are constantly emphasized during the class. Due to the more advanced level of the projects and techniques to be covered in this class, we recommend that interested students be proficient in basic tool use and tooling techniques. We highly recommend that students attend a Woodturning 101 Workshop prior to participating in this workshop.